I stand corrected. You can indeed get some interesting overclocking out of the X61s and X61T motherboards, even given the ... very constrained... cooling. So I'm going to start in on what I finished tonight. I bought a batch of surplus motherboards (15 of them) to get some more complete statistical analysis of what I could expect from power usage, undervolting and overclocking. There's been lots of interesting data... I'll be getting to that. Most recently though I've been playing with the BSEL mod that increases the FSB from 200MHz to 266MHz by lifting pin 7 of the clockgen and tying it to ground. 2) increasing CPU voltage past maximum VID via the feedback resistor mod was not increasing stability or improving overclocks. Well, not much. Others have mentioned the X61s and X61T have only 'half a VRM' (the second supply channel present in the X61 is disabled and unpopulated) and this certainly looked more like a power limitation than the CPU itself, so... I decided to populate and activate the missing second VRM channel on one of my sacrificial X61T motherboards. First report: I got lucky! Two days of soldering under a USB microscope (all that 0402 soldered directly to ground and power planes, NNNGH) and it worked first try. It also had the desired effect! On a motherboard that had previously insta-crashed trying to run the L7500 at 266FSB and dual-IDA (2.4GHz), I can not only run dual-IDA, but I can run it undervolted. 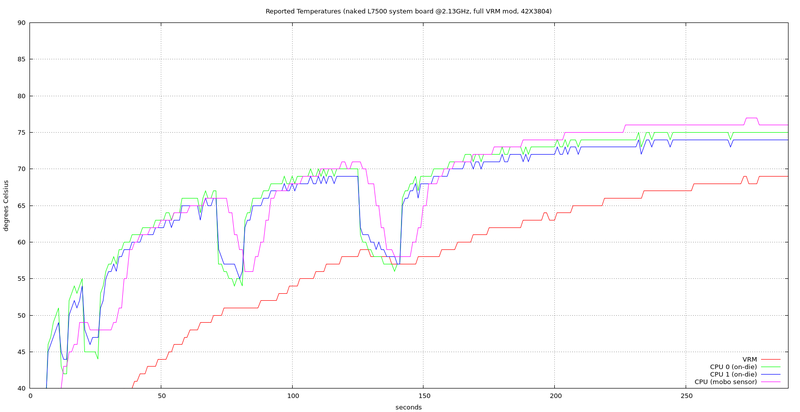 The VRM sensor never gets to 70C, and the machine is _not throttling_. Granted I'm using the less-common higher-performance heatsink, CPU is hovering at 90C and the fan is running full-tilt, but the overclock appears to actually be sustainable. It's not quite all peaches-and-cream. The second VRM channel increases idle draw by about 200mW. And the overclock itself increases idle draw another 300mW. So, BSEL + full VRM blows an extra half a watt out the airlock at baseline. I really need to try one of the L7700 boards now. Wonderful. 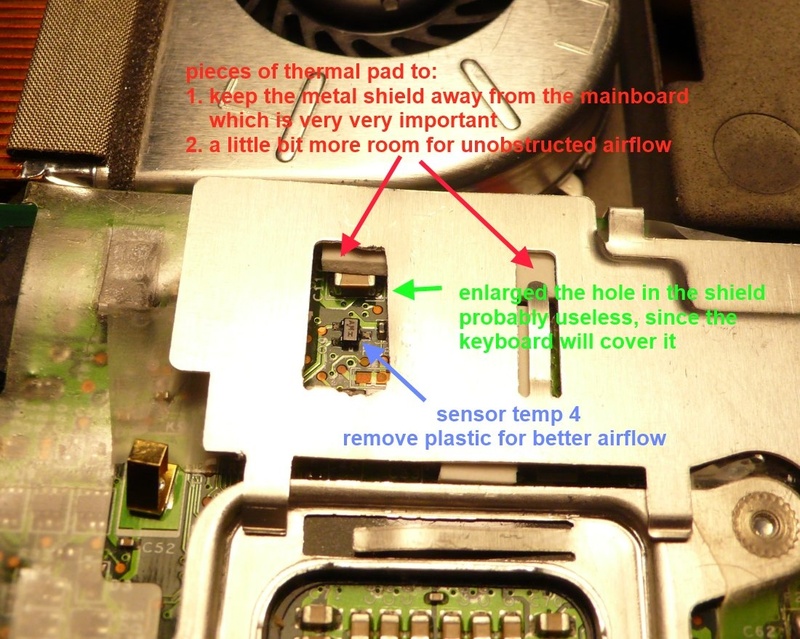 The scientific approach to OC a Thinkpad. Can you say how many of your L7500 boards have problems with the OC? wileE wrote: Can you say how many of your L7500 boards have problems with the OC? Of the twelve L7500 boards, three were not fully stable. However, I noticed halfway through that I was testing with the wrong RAM sticks; I'd accidentally grabbed a pair of unmodded PC2-6400 instead of the pair I flashed to timings certain to work with the overclock. So I need to repeat the tests. One of the other interesting tidbits-- each processor reported a different set of VIDs for its supported frequencies. No pattern by stepping or mobo part number. And the oddest bit of all-- the processor that required the most voltage in SLFM mode actually drew the least power! I've been speculating ever since what Intel's actual binning criteria are. Anyway, about the fan: Here's that dual heatpipe version. I'm also getting real good at swapping tips on the iron while they're still hot. The heatsink assembly in your link looks like the one in my aunt's X60. None of the X61 units I've worked on had that heatsink design. There's some variation I haven't managed to completely isolate in my power draw testing. I'm no longer convinced having the second VRM phase populated and active is actually drawing any additional baseline power. In testing last night, the 200mW draw increase disappeared-- two phase (full) VRM drew the same at idle as the original one-phase 'half-a-VRM'. And that's what I'd have expected, given that the VRM controller should and does shut down the second VRM phase at low draw. I wonder if the problem is variability in console linux (maybe I should be doing this embedded-style or if I cheaped out too much on my wattmeter shunt. I am going to try this myself as soon as I have a spare x61t board and a normal defective x61 board for the parts. The CPU throttling starts when the temperature for sensor no 4 reaches 91°C (occurs sometimes when running prime95 torture test). Is it the second one from the left on this picture? Can you tell me the maximum rpm of the fan (at level 64 with TPFancontrol)? If it is higher than the maximum rpm of the fan on the left, then it might be worth swapping the fan for me. 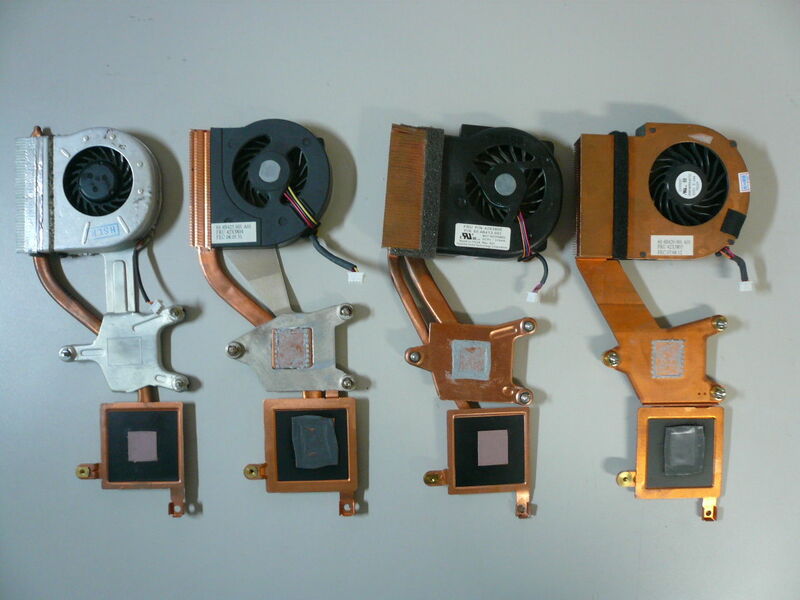 I have the modified 42W2522 heatsink, but still the old fan from the cooler assembly on the left on the picture. Yes. I measured it before, and it has significantly better performance than the smaller one (hm, the left-hand fan in that pic is X60s/t specific. The X61s/t version has a copper heatsink and a slightly different surface on the CPU sink). el-sahef wrote: Can you tell me the maximum rpm of the fan (at level 64 with TPFancontrol)? No Windows here, but I'll check it later when set to full speed under linux. I have noticed that on the X61 models, the fan has a significantly higher speed when set to 'on' with the fan control disengaged via ACPI than the supposed maximum level using the fan control. ThinkFan (under linux) does not access this speed, I wonder if TPFancontrol does or does not. el-sahef wrote: If it is higher than the maximum rpm of the fan on the left, then it might be worth swapping the fan for me. I have the modified 42W2522 heatsink, but still the old fan from the cooler assembly on the left on the picture. It has a higher power draw rating, I'd expect it can move more air. Also consider the Sanyo Maglev fans being sold for the X200s/t; they're a compatible size also with a higher power draw rating. I'll try those too eventually. Here's links to very large pics that show the changes for adding the second VRM phase to X61s and t motherboards. Red numbers are additions, blue numbers are changes, yellow are components to be removed. The pics are composites stitched together from my USB microscope, so don't look too hard at the slightly wonky perspectives. The easiest way to get the exact parts needed is probably to raid a broken X61 mobo (what I did). I was going to make such pictures if I succeed in adding the second VRM channel, but you were faster . So, I tested seven different fans for the X60/1 regular, s, and tablet models. I was a bit surprised by some of the results. Raw temperature performance is the plot linked at the bottom. 41V9748 is the X60s/t cooler with the 'tin-can' style fan, aluminum heatsink fins, and a recessed rectangle for the CPU die set into the aluminum heatspreader surface. It should be noted that the recess is shaped and positioned for the CoreDuo (X60s/t), and as a result most of the Core2Duo die does not make good contact with the mounting surface. I did not lap the surface flush. The graph shows the impact of this pretty clearly. 42X4399 is the X61s/t cooler with the 'tin-can' style fan, copper heatsink fins, and a featureless heatspreader surface. This is the usual part found int he X61s/t. The same part also pops up as '42X3804'. 42W2522 is the X60 cooler that runs two heatpipes directly through the middle of the fins. This is the one featured in a modding thread on the German forum to make it fit in a tablet or s model. I tested one in stock form, and another after modding down for the tablet/s the same way as in the German thread. 42X3804 in this test is one of the less common, higher performance X61s/t fans with a thicker heatpipe and black Panasonic fan. Note that this part number is also used on units that look like the 42X4399. 42X3805 is used on two different parts, a one-heatpipe unit that uses a Panasonic fan, and a two-heatpipe unit that uses a Toshiba fan. I tested both. Testing consisted of a default 64-bit linpack run on both cores. Each test was run on the same motherboard, starting cold. Each heatsink was installed with fresh AS5 for the CPU and 3.2W/k .5mm pads for the GPU. The motherboard used was modded for full VRM (to avoid any chance of the VRM causing thermal throttling) with a 266FB overclock and 4GB (2x2GB) un-flashed Elpida ram running at 888MHz with 1066MHz timings... just to make sure there was plenty of heat. The motherboard was run naked outside of a machine with the heatsink assembly exposed and completely unobstructed. The performance would be somewhat lower in an actual assembled machine. https://people.xiph.org/~xiphmont/think ... -temps.png <- plot of fan temps. The 42W2522 that people are modding to fit in the s and tablet? Don't bother-- it's a major loser. The stock X61s/t fan with the black Panasonic fan performs better. Also, the one-pipe and two-pipe 42X3805 look to have identical performance, expect the one-pipe version is running the fan slower and considerably quieter. Last edited by xiphmont on Tue Nov 04, 2014 10:48 pm, edited 1 time in total. I am very glad that you like the X61T. Love these posts. The results with the 42W2522 are a little bit of a surprise. Maybe the poor performance was the reason it was discontinued before the X61 came out. My X61T L7500 works fine at 2.13GHz with the tin-can 42X4399 (which is almost always sold as 42X3804). But I just ripped out the board to check your results with a double heatpipe 42X3805. Those temps are a big surprise. Unfortunately the good version of the 42X3804 is very hard to find at a reasonable price here in Germany. Got nearly the same results comparing the 42X4399 to 42X3805. CPU max with the 42X4299 was 81° with my board. And max RPM were shown as 150 RPM lower with both fans. Ran LynX for 30 min with 2GB unmodified Kingston 667 RAM. CPU fixed at 2.13GHz. The real problem is the gpu temp (temp4 in sensors). It runs much hotter then the CPU. Strangely with the naked board on the ultrabase I had peak temps of 98° with 42X4399 today. Never got above 92° when the board was inside the laptop. wileE wrote: The results with the 42W2522 are a little bit of a surprise. Maybe the poor performance was the reason it was discontinued before the X61 came out. I acquired three, and modded what looked like the best two. While I was cutting them down it became apparent the soldering had missed or mostly missed a good number of the fins, which were just being held in place by the fins around them. They were held near/against the heatpipe rather than thermally bonded, so that might have a lot to do with the poor performance. I'd have guessed it was a hard design to make well; looks like that was actually the case. wileE wrote: My X61T L7500 works fine at 2.13GHz with the tin-can 42X4399 (which is almost always sold as 42X3804). I've got a number of 'tin can' types that are actually marked FRU 42X3804, so it's no wonder part vendors can't keep them straight either. wileE wrote: But I just ripped out the board to check your results with a double heatpipe 42X3805. Those temps are a big surprise. wileE wrote: Unfortunately the good version of the 42X3804 is very hard to find at a reasonable price here in Germany. Yeah. Those just aren't cheap. They're selling for USD 35 new on ebay here, that's almost double the more common part. wileE wrote: Got nearly the same results comparing the 42X4399 to 42X3805. CPU max with the 42X4299 was 81° with my board. And max RPM were shown as 150 RPM lower with both fans. wileE wrote: Ran LynX for 30 min with 2GB unmodified Kingston 667 RAM. CPU fixed at 2.13GHz. Ah, right, forgot to say I ran the test with the VID/FID locked at 0x081c, so also 2.13GHz. So you replicated perfectly. wileE wrote: The real problem is the gpu temp (temp4 in sensors). It runs much hotter then the CPU. Sensor 4 is not the GPU. Look for the SOT-23-3 transistor just to the left of the four VRM mosfets-- that's it. You can verify by hitting it with a little compressed air and watching the temp reading immediately plummet. ...so your VRM is very hot just like mine was before I filled in the second phase. wileE wrote: Strangely with the naked board on the ultrabase I had peak temps of 98° with 42X4399 today. Never got above 92° when the board was inside the laptop. Not surprising at all. When the board is naked or keyboard is off, the fan is not drawing any air over the mosfets. They're being cooled by passive convection only. Thank you for your comparison! Seems that I should have bought the 42X3804. But the cheapest offer shipping to germany I found was this and over in the german forum there was no one that had tested this heatsink against the 42X4399, so I decided to get the 42W2522 because it has a bigger surface even after the modification + two heatpipes instead of one and therefore I expected it to perform better. The 42X3804 has a slightly bigger surface than the 42X4399 (because the 42X4399 has rectangular cutouts in its fins), a different fan and the heatspreader surface made of copper, but I did not expect it to perform this much better than the 42X4399. Did you set the fan speed manually (if yes, to what level) or did the BIOS control the fan speed during the test? I wonder if the higher fan speed of the 42X3804 is the main cause for its superior performance compared to the modded 42W2522 or if the heatpipe is also better than those of the 42W2522. What fan did you use to test the 42W2522 after modification? el-sahef wrote: Did you set the fan speed manually (if yes, to what level) or did the BIOS control the fan speed during the test? The fan speed was set manually to 'full-speed' via linux ACPI (this is apparently equivalent to setting the fan 'on' and the fan control to 'disengaged'). For some reason, this gives a higher fan speed than the highest level settable via normal fan control (7 under linux). el-sahef wrote: I wonder if the higher fan speed of the 42X3804 is the main cause for its superior performance compared to the modded 42W2522 or if the heatpipe is also better than those of the 42W2522. Oh! and that reminds me-- I simply mounted the smaller fan from the 42X4399, I did _not_ make the last additional cut out of the right side of the fan housing necessary for it to actually fit in the s/t base. That would hurt performance even more, and given that performance wasn't good to start with, I didn't see a need to pursue that to its logical end. Even if it would be a bit better, it still renders the mod useless since the 42X3804 is plug and play. Because I have the modded 42W2522 already, there is one thing I might try before replacing it possibly with a 42X3804. The reason for the poor performance of the 42W2522 (in relation to its surface) is either the bad contact between the heatpipe and the fins or the performance of the heatpipe. The former can possibly be solved by applying arctic silver thermal adhesive. el-sahef wrote: The reason for the poor performance of the 42W2522 (in relation to its surface) is either the bad contact between the heatpipe and the fins or the performance of the heatpipe. The former can possibly be solved by applying arctic silver thermal adhesive. Agreed, but not sure how you'd be able to use the thermal adhesive properly. It's very thick and designed to bond in a thin film between parts that are clamped together (I've used it many times-- it's really good stuff actually). Adding solder might go better since solder will wick between hot surfaces via capillary action. But an old, oxidized heatsink might make that hard without a really aggressive flux, and I don't know how one goes about soldering to a heatpipe anyway. Seems like it might be frustrating (or cause the heatpipe to leak). Last edited by xiphmont on Tue Nov 04, 2014 10:38 pm, edited 1 time in total. I used to have the 42X3804 with black fan which I replaced with 41V9749. Any idea about the effectiveness of this fan compared to others? Also, 41V9738 seems to be an X60 bottom cover, not fan assembly. 85101 wrote: I used to have the 42X3804 with black fan which I replaced with 41V9749. Any idea about the effectiveness of this fan compared to others? Also, 41V9738 seems to be an X60 bottom cover, not fan assembly. /me checks the fan again. Drat, I mis-copied the FRU number. It's 41V9748 on the fan. Let me go back and fix the graphs/posts. 41V9749 looks like a full-sized X60 fan according to google (similar or same to the two-pipe 3805). Thanks for the info on temp4. Found the transistor here:http://i.imgur.com/6Va2wnc.jpg?1. Going to try improving the airflow there. The readings from that sensor had me puzzled for the last two years. Stupid. Should have questioned that earlier. Along with a million other X61 users. Under windows many of us use TPFC for controlling the fan. And this otherwise great programm calls temp4 gpu in the X6x. So nobody ever looked at that tiny component as the cause for the high temperatures in the s and T models, after doing the pinmod. In the X61 T7300@2.66GHz temp4 is nearly always well below the CPU temperatures. With a L7500@2.13GHz temp4 is 10 to 15° above the CPU temperature while running a benchmark. Oh, that is _awesome_. When the manufacturer [counterfeiter?] has just. given. up. wileE wrote: Thanks for the info on temp4. Found the transistor here:http://i.imgur.com/6Va2wnc.jpg?1. Yup, that's the one. An old-school 2N3904 used as a temp sensor. The MAX6602 temp monitor IC it's connected to is hidden under the pccard slot. wileE wrote: So nobody ever looked at that tiny component as the cause for the high temperatures in the s and T models, after doing the pinmod. Not a chance. Its a 42X4399. Even Samsung XGA displays labeled as BoeHydis HV121P01-100, yes. Much better now. Peak at 87°, often below 80°. I would guess 82° average running LynX for an hour. to solder in all those tiny components though. But if the original supplier made that label, wow. The one I'm running into constantly right now is Chinese firms taking old keyboards, shooting them with a layer of matte lacquer to give them a temorarily like-new texture, and selling them as new. It looks pretty good, but the lacquer only lasts a month and it makes a mess internally. Oh, and the stuff doesn't hold up to most cleaning solutions. 'No Shinny Keys! Guaranteed!' Grr. I tried this on my x61t board according to the instructions here and it works as intended. To make things easier, I had a printout of page 67 from the schematic where all the differences are listed. On this sheet, I put some adhesive tape where I could place the desoldered components on. Before, the temperature of sensor 4 was 10°C higher than the CPU temperature at full load. Now it is 10 to 15°C lower than the CPU temperature, so this is a huge improvement (especially because the CPU does not throttle any more because the temperature for sensor 4 does not exceed 90°C). Unfortunately, I still can not undervolt my CPU (pinmodded), because it will become unstable if the voltage is lowered the slightest amount. I damaged the lower right pad for Q7 and Q8, so I had to solder a cable connection to the pins. Looks odd, but works. el-sahef wrote: Unfortunately, I still can not undervolt my CPU (pinmodded), because it will become unstable if the voltage is lowered the slightest amount. Drat, that's too bad. Tested w/dual-IDA right? On mine here, the lowest I got a successful linpack run out of was 0x921. at 0x920 I get occasional FPU errors/MCEs. That's not a huge undervolting, but enough to make a noticable dent in draw. I haven't tried with any of the L7700 boards yet. No, this was with 2133 MHz, so no dual IDA. Its not a big deal, I did it mainly to try it out and to lower the temperature.